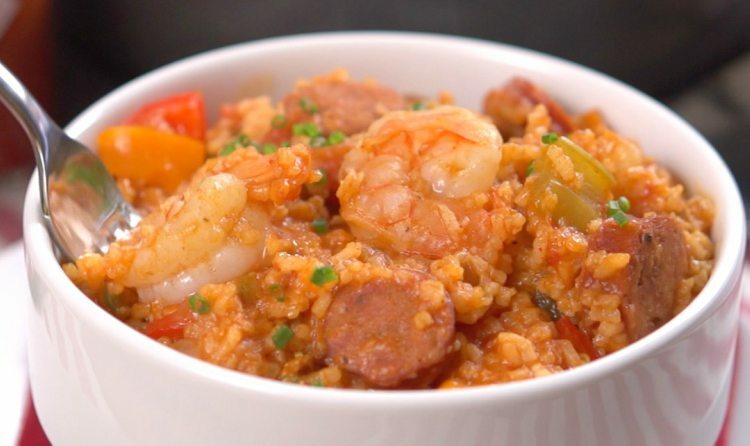 First bake the chicken breasts – preferably in the 4-quart or larger pot you’re going to cook the Jambalaya in – until they’re tender and juicy, don’t overcook. I season moderately with Nature’s Seasoning, your choice. After the chicken is baked, set the breasts aside to be shredded later. Do not discard the chicken stock! You will use it in the recipe. Set the pot of chicken stock aside, preferably in the refrigerator. After it cools, skim and discard the fat. While the stock is cooling, cut onions and celery as described above and set aside. After skimming and discarding the fat from the stock, add Zatarain’s Jambalaya Mix to the chicken stock with water required on back of boxes. ﻿*﻿NOTE: I first open the cans of tomatoes and use the drained tomato water from the cans, then finish adding tap water for amount required on boxes. Add all the Cream of Celery condensed soup (do NOT add water as described on the cans’ instructions!) and the drained diced tomatoes and start cooking on low to medium low heat. Rice has a tendency to stick and scorch, so you MUST stir regularly and often all the while the recipe is cooking! Add the hot sauce and the chopped onions and celery, stirring regularly. Slice the beef sausage ropes into thin slices (approx. one-eighth to one-quarter inch) and add to the mix. Shred the chicken and add to the mix. Continue cooking on low to medium low, stirring often. NOTE: You will have overflow, so have a 2-quart or larger pot ready. Dump the thoroughly mixed overflow into the extra pot and cook on low or medium low on a separate burner. Continue stirring often. The Jambalaya is almost ready after the onions turn clear (approx. 3 to 5 hours, constantly stirred). When the onions turn clear, add the frozen shrimp and continue stirring. The recipe should be mushy, like stew, not soup. If it’s too dry and stiff, add a little water a third of a cup at a time and continue heating on low and stirring. When the shrimp turn pink, you are ready to serve and chow down! I serve with cornbread and a garden salad. I recommend you do also, because cornbread is extra yummy with this recipe. Makes 5 to 6 quarts. Save or freeze the leftovers if you have any and reheat, again stirring often to prevent the rice from sticking or scorching. Enjoy! Your family and friends will love you and want the recipe if you share a bowl with them.